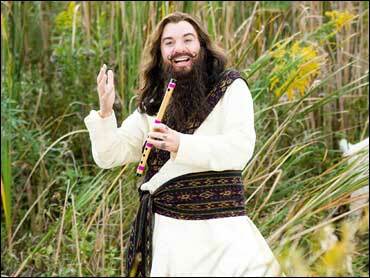 Mike Myers' "The Love Guru" has found some disciples among Razzies voters, who pick Hollywood's lowest achievements. And Paris Hilton is getting her own Razzies moment with three awards all on her own at a ceremony that spoofs the Academy Awards on the eve of the Oscars. "The Love Guru" won three Razzies on Saturday for worst picture, actor (Myers in the title role) and screenplay, which Myers co-wrote. Hilton's three prizes are worst actress for "The Hottie and the Nottie," supporting actress for "Repo! The Genetic Opera" and screen couple alongside either of her "Hottie" co-stars, Christine Lakin or Joel David Moore. With three Razzies, Hilton tied the record set last year by Eddie Murphy, who won worst actor, supporting actor and supporting actress for his multiple roles in "Norbit." Pierce Brosnan was chosen as worst supporting actor for "Mamma Mia!" The worst-director Razzie went to Uwe Boll for three movies: "In the Name of the King: A Dungeon Siege Tale," "1968: Tunnel Rats" and "Postal." Razzies voters also gave a prize for worst career achievement to Boll, whose critically drubbed movies include "Bloodrayne" and its sequel. "Indiana Jones and the Kingdom of the Crystal Skull" was named worst prequel, remake, rip-off or sequel. John Wilson, founder of the Razzies, said Boll and Hilton's movies are so bad, he could envision a collaboration between the two. "The Love Guru" features Myers as the world's second-best self-help guru, who must come to love himself before he can fully realize his potential. The movie topped out at $32 million at the domestic box office, chump change compared to the haul of Myers' "Austin Powers" sequels. Wilson disagreed with other Razzies voters on "The Love Guru," saying that after watching it again to pull clips for the group's awards ceremony Saturday night, he did not think it was the year's worst movie. "A couple of things he did got me to laugh, and these days, two laughs in a comedy is a high ratio," Wilson said. In "The Hottie and the Nottie," Hilton plays a babe who won't date until her homely best pal lands a man. Hilton has a small role in "Repo," a horror musical about organ recipients who face a visit from the repo man if they fall behind on the payments. "Repo" and "Hottie" combined did not even manage to take in $200,000 at the domestic box office. Unlike many years, when one movie dominates, the Razzies were shared among a variety of flicks. One voter joked that "we decided to spread the loathe around," Wilson said. "Everybody got kicked in the shin at least a little."